Wheatless Mama: Happy International Babywearing Week! Here at Wheatless Mama, we are a babywearing family. 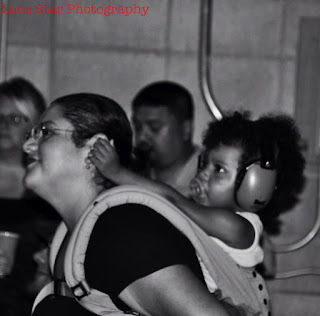 This is a great picture by my friend Travelgirl @ Lone Star Photography. We were at a punk rock show at The Factory here in Lufkin. Can you guess who we were listening to? You guessed correct! THE HATES! In this picture we are using an Ergo sport. In the official blog badge we are in a wrap. Even DH wears Ravebaby. We highly recommend it!